I just spent a little over a week in California, and while I was there my mind was boggled by how expensive everything seemed to me. I live in Phoenix, and I rarely travel, so I'm sure that I got a double-whammy when I went to pay for things. Or a triple-whammy if you consider that I can remember all of the way back to the 1960s, when I could buy a comic book for twelve cents! Whether something is expensive, of course, or cheap, always depends on the person who is doing the paying. And as someone from Phoenix I was amazed at how expensive the houses are in California. Many of my conversations were with people who assured me that, really, a one-bedroom apartment rents for that much. And that led me to listen to when people said that, "they couldn't afford it". I like hearing the phrase "I can't afford it" because sometimes it makes sense to me and sometimes it just seems ridiculous. I'm not very good at math, but I can do some quick calculations of what people have to pay for their mortgage, or property taxes, or whatever. I'm familiar with Proposition 13, and I know that there are people living under its protection, mostly the generation of my parents. Prop 13, which passed when I lived in Los Angeles in the 1980s, allowed people to stay in their homes with their property taxes assessed based on their original mortgage, not the inflating home values. Before Prop 13, people in California were literally losing their homes as they were unable to pay their property taxes. So, yes, there are a fair number of people who are living very close to their incomes, especially elderly people. And when these people say "they can't afford it", even if I see that they're living in a house that now worth half a million bucks, I believe them. If their property taxes jumped from paying on a $50,000 house to paying on a $500,000 house, they would literally not be able to afford it. But I'm not really talking about those people, I'm talking about people who have plenty of money, but are careful about how they spend it. To me, of course, the people I see in California look like the guy on Monopoly money, wearing a top hat, and lighting their cigar with a hundred dollar bill. I've never actually seen it with my own eyes, but I have it on good authority that you can go to an ordinary bar in San Francisco, and pay twenty-seven dollars for a class of wine. So when I step off of the plane in California as an Arizonian, it's as if I'm dealing with a different currency. I like to think that I can move the decimal point over, but sometimes it has to be moved two places. And of course by now you realize that I just wanted to grab everyone in California by the lapels and ask, "how can you afford this? ", but obviously a lot of people can, and do. Stuff that's insanely expensive to my Arizona eyes sells so fast in California it's as if they were giving it away. My jaw just hangs open the whole time I'm in Cali. In a long life, I've learned that people will pay for what they value. Speaking for myself, I wouldn't walk across the street to watch a football game, although I'm sure I'd go if someone I knew was on the team. But otherwise, I'm gonna say that I can't afford it. In fact, even when I see the price of parking at stadiums I say, "I can't afford that!" And I certainly can't afford a glass of beer sold at a stadium! Well, really I guess I could if I valued it, but I don't. And that's the lesson I'm learning. 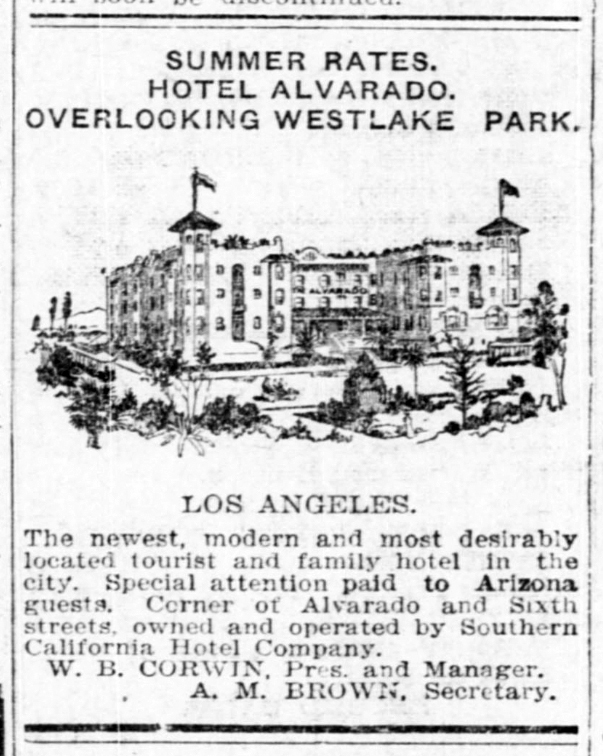 Image at the top of this post: 1904 ad for the Alvarado Hotel in Los Angeles, California. 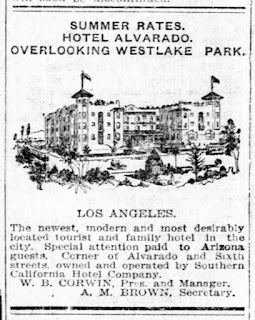 I really don't know how much the rooms rented for at the time, but if you say a dollar a night, it would be thirty dollars a month, with meals being probably close to fifty cents, and a shave-and-haircut being two bits (25 cents). Wildly expensive!